SAN DIEGO, Calif. – KTM riders showed up READY TO RACE on Saturday for Round 6 of the AMA Supercross Championship in San Diego, which served as California’s fourth and final stop on the 17-round tour. Aboard their 450 SX-F FACTORY EDITION machines, KTM riders filled three of the top-five premier 450SX positions, with two spots atop the overall podium. Highlighting the night was Red Bull KTM Factory Racing’s Marvin Musquin, who returned to the 450SX podium for the first time since his Round 1 victory, to capture 2nd place for the night. 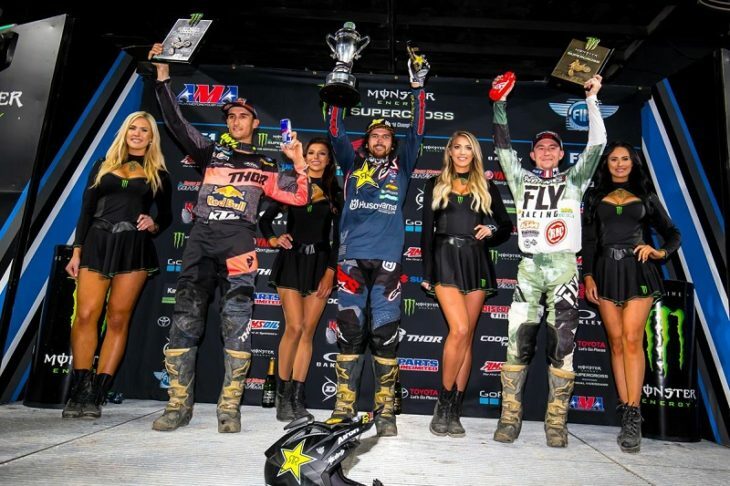 Rocky Mountain ATV*MC – WPS – KTM’s Blake Baggett continued his impressive podium streak to two-in-a-row on Saturday with another 3rd place finish, while Red Bull KTM Factory Racing’s Broc Tickle earned his best finish of the season with 5th place. The evening started off slow for all three riders as they qualified 4th (Baggett), 6th (Musquin) and 7th (Tickle) in 450SX Heat 2. However, as the gate dropped for the Main Event, the riders proved they knew when to make it count. Musquin powered his KTM 450 SX-F FACTORY EDITION into a top-three position off the start, where he battled for a podium position throughout the entire 24-lap Main Event. Musquin dropped back to 4th place briefly in the middle of the race but the Frenchmen dug deep to climb his way back up to 3rd and eventually 2nd place, where he finished strong to put himself back on the podium once again. After missing Round 2 due to a shoulder injury, Musquin continues to salvage his rank in the 450SX Championship, where he now sits in 8th place overall with one victory under his belt. Red Bull KTM Factory Racing Team’s Broc Tickle started just outside the top-ten in the Main Event. Tickle wasted no time in climbing his way through the pack as he made it up to 6th place by the halfway point. Tickle positioned himself behind fellow KTM rider Blake Baggett and the duo charged their way toward the front. With two laps to go, Baggett made his move on Cole Seely ultimately take over the 3rd and final podium position to make his second-straight appearance on the box. Tickle continued to charge in the final moments of the race where he finished a season-best 5th place to further KTM’s impressive showing in the 450SX class. After six rounds, Tickle sits 10th overall in the 450SX Championship Standings.